FRANKFURT -- Daimler may deepen its cooperation with Renault-Nissan, finance chief Bodo Uebber said. 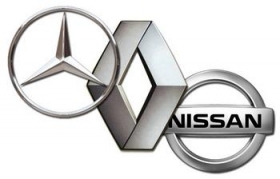 Daimler and Renault-Nissan are ahead of schedule in driving forward their alliance projects, he told Boersen-Zeitung in an interview published on Saturday. "We are discussing further options to cooperate...we are debating a deeper collaboration on compact cars," Uebber said. Last April, Daimler and Renault-Nissan announced a strategic cooperation to jointly develop a new rear-wheel drive platform to underpin the next Smart ForTwo, a new Smart four-seater and the next Renault Twingo. Renault will also supply Daimler with three- and four-cylinder gasoline and diesel engines to be used by Smart and in Mercedes' new A- and B-class premium compact cars. Daimler will supply Infiniti, Nissan's luxury division with four- and six-cylinder gasoline and diesel engines. Uebber told Boersen-Zeitung the companies are in talks about batteries as well. He reaffirmed management's comments from earlier in the year that talks to purchase Fiat Industrial -- which would have given Daimler control over agricultural machinery maker Case-New Holland -- collapsed above all over the price. Uebber said Daimler is not planning to venture into new business areas after taking over Tognum, a maker of industrial-size diesel engines, with UK aero-engine group Rolls Royce earlier this year, he told the newspaper. "At the moment we are not planning any major takeovers," Uebber said, adding that the company was well-positioned in regard to mergers and acquisitions as well as cooperating with other groups. "We... believe the stakes (we hold) are currently completely sufficient to reach the goals attached to them," Uebber said. Additionally, Uebber said Daimler may consider using part of its industrial net cash position of 12.4 billion euros to plug a 3 billion euro hole in its pension debt.